There was a time when I had a gorgeous yard. Not that I put a lot of time, work or effort into keeping it well groomed, mind you. When we bought the house, the previous owners had apparently done a great job of investing time, sweat and effort into meticulously keeping it well groomed. The grass was lush and full…not a single bare patch to be found. There were no dandelions…no crabgrass…no weeds…it was golf course quality grass, that’s for sure. When I took over as the primary groundskeeper, I put in a valiant effort at keeping it groomed to that standard. Within a year, as SD made friends with all the neighborhood kids, it became painfully obvious that I was in for a battle of epic proportions. We bought the playground, and almost instantly our yard became *the* yard to hang out in. The following year, the trampoline followed, and so did the circle of dead grass under it…and all the socks and shoes left behind from your friends in the neighborhood! Then came the pool…two years with an 18′ pop-up pool gave us another “crop circle” in the back. The pool didn’t survive past the second season, and the grass around it has never been the same. I’m not sure at what point I gave up, but certainly by the time NE and SI came along, I had resigned myself to the notion that I could either raise a yard or raise kids…but not both. So for several years, I neglected it…only mowing it. No watering…no over-seeding…no aerating…no weeding…no fertilizing…nothing but the weekly mow. Within about three summers, my yard had gone from a beautiful landscape of plush, vibrant green to a hodgepodge of barren spots, crabgrass and dandelions…with some good grass mixed in every so often. My neglect had tarnished what was once a sight to behold. Fatherhood is like that isn’t it. I can spend (and certainly will) years, even decades of time, sweat and tears pouring love into you, showing you the love of Christ. I will devote all my efforts in the next 18 years to bringing you to Christ and helping you strengthen your relationship with Him. I’ll do so because I have no greater commandment from God but to love Him and love others. It’s my love for Him…and for you…that drives my passion to live with you on the over side of eternity. However, once you’re out of my care, I have no control over the person you will become…the choices you will make…the life you will live. Like the homeowner before me who dutifully tended to my yard when it was in his care, leaving it to me to carry on its care…or neglect…I too must face the day that you are responsible for your own walk of faith. I will soon face the day that I have to sit back and watch as you continue to flourish in your faith…or allow weeds to grow along your path. Weeds. I’ve let the weeds in the yard take over in the past few years, so this year I’ve struck out anew…on a mission to reclaim my little plush plot of land. Like any good warrior, I spent time learning about my enemy…its tactics…its survival instincts…its strengths…its weaknesses. I learned all that I could because it’s not until we know our enemy that we can overcome him. Did you know that the root of the dandelion can grow 10″ deep? I didn’t…until now. Had I not known that important piece of information, my methods would not have worked, because I would have simply pulled the visible part of the weed out of the ground…fruitless! Turns out they also thrive better when there are patches of dead grass. They seek out and thrive in those areas because there is less competition for sunlight, water and nutrients in the soil. Makes sense really, but not something I’d given much thought to before now. Which is how I came to one of the lessons I’ve learned in all of this…that it’s okay for a guy to read the instruction manual from time to time. Yeah, I know. I’ll catch all kinds of grief for admitting that. Guys are notorious for not reading directions. I can count on one hand the number of times I’ve read the instructions when assembling a new project…or read the owner’s manual on a new electronics purchase. It’s our thing…guys just know how to fix things…without being told or shown, we know. However, I’ll openly admit that it’s okay to read the owner’s manual every now and then. Yeah, just this month I broke down and resorted to reading the owner’s manual. I bought a new trimmer last season. It came with a spool of line that ran out earlier this month. It also came with some shorter 10″ lengths of line that are supposed to fit into the head of the trimmer differently, so that once they’re loaded they lock in place…and are used in place of the longer spool of line. I struggled for days trying to figure out how to lock those little suckers into the head. I’d work on it for awhile one day and get frustrated to the point that all I wanted to do was throw the whole stupid trimmer away! Aagghh!! So I’d set it down and forget it. The following day, I’d pick it up again and work diligently to figure it out on my own. I reasoned that “it can’t be that hard…I don’t need to read the book.” After days of frustration, I finally broke down and pulled out the book, and within only 10 minutes of reading, I was able to figure out how to accomplish what I wanted. Ten minutes! Really? Had I just read the stupid book two days ago, how much time and frustration would I have saved? By the way…it wasn’t that hard to figure out. In fact, the solution was right before my eyes the whole time, but I was too blinded by pride and frustration to see it. Ssshhh. Don’t tell your mom that, okay? So, back to the weeds. Once I’d done my research, and my recon was complete, I launched my offensive. I meticulously sprayed every one of those pesky little dandelions. I kept them mowed down before they could sprout and spread their seed to propagate their species. I over-seeded, laying down new seed, and have kept it watered. I’ve spread fertilizer at just the right time, and I’ll continue fertilizing every 2-3 months as scheduled. I’ve kept vigil throughout the last month, not letting down my guard and quickly jumping on any of those little suckers that have sprouted up…yep, I’ve waged an all-out war to turn the tide in favor of healthy grass. So far, it’s looking good for Team Dad, but only time will tell if my efforts will prove successful. Certainly as next season approaches, some will return, but hopefully not in such large mass. Hopefully, what I’ve done this year has laid some good groundwork to reducing their numbers as the years pass. Weeds. There are some eery similarities to the weeds in our yard and the weeds in our lives. The weeds that grow in our yard lurk just below the surface, out of sight…until just the right conditions are present to strike. When they attack, they spring up with little warning. Left untreated, they spread their seed so that even more come up the following year. Even one weed left untreated can quickly spread out of control before you know it. They can very quickly drown out the good grass, suffocating it as they compete for nutrients, water and sunlight. The root of these weeds can grow deep down into the soil, making it difficult to uproot. Simply attacking what is above the surface is not sufficient to kill it, because the root remains and will certainly re-sprout the following year. Yep. Unattended, these weeds will quickly take control of a yard so that no sign of the good healthy grass even exists. The weeds in our spiritual lives are exactly the same! So many things compete for our attention and affection that when left unattended, our relationship with God can quickly be suffocated by the world. The weeds in our spiritual life come in many forms. Work. Money. Pride. Greed. Selfishness. Anger. Resentment. Family. Friends. Ministry. Yes, even family and ministry can be weeds if we allow. Anything that competes with our attention and affection for God has the potential to be a weed. God is to be our number one love…above family and above ministry. One of the things I’ve learned through three seasons of leading the Upward Sports ministry at our church is that even service to the Lord can distract us from the Lord. You wouldn’t think that would be possible, but trust me…it is! We can get so wrapped up in what we’re doing that we forget to take time to connect and grow with God. I find that I struggle most when I fail to read God’s Word consistently. When I roll out of bed and get my day on…without taking time to read what God has prepared for me in His Word for that day, I find that I’m more susceptible to temptation, and I wander from the path that points toward Him. I have also found that in reading the Word in the morning, my mind and heart are better equipped and prepared to deal with the specific problems I will face that day. I can’t count how many times I’ve done my morning devotion, and at some point in my day have faced a spiritual, emotional or physical battle that God prepared me for through that morning’s devotion. That’s not a coincidence…that’s God knowing all…and working it all through His plan…for His glory! One of the other major components in our battle against the weeds in our life goes hand-in-hand with Bible study. Prayer is our direct pipeline to God. It is our opportunity to praise God for all He is and all He’s done, to ask Him to meet our needs, to ask Him to meet the needs of others, to tell him the desires of our heart. He knows the desires of our hearts already, but He wants to hear us…He wants to communicate with us…not just to listen to us, but for us to hear Him. Praying is as much about talking as it is about listening. In your prayers, take time to simply sit and listen for Him. His voice comes as the soft, gentle whispers on the heart. ..as the breeze blows through the trees, His voice comes to our heart. If we don’t stop to listen, we won’t hear Him. Prayer comes in many shapes and sizes. It can be aloud with family. It can be alone in our fear. It can be silent as we face an obstacle. It can be a short sentence…even one word. Or a lengthy conversation. It should be an opportunity to praise Him for being God and acknowledging that we’re not. However you pray, pray often. I’ve also learned that in our time of hurting, we rely on our relationships. While God’s grace carries us, it’s our relationships within the body of Christ that He uses to strengthen us. It’s the accountability I have within my circle of believers that helps to keep me from veering into sin. It’s fellowship with like-minded people…people that are strong in their faith… that encourages me to continue the fight. I can call upon them for help in finding scripture to address the specific weed I’m dealing with at the time. Even with all the Bible study I can do, I have encountered times I can’t find the answers I need right away. It’s fellow believers who can point me in the right direction. It is in “over-seeding” my relationships with the good seed that the lush, green grass of my faith grows and drowns out the weeds. Obedience is also important in fighting off the weeds. That word can sound scary, but it’s not if you look at it in the right context. Practice makes perfect. 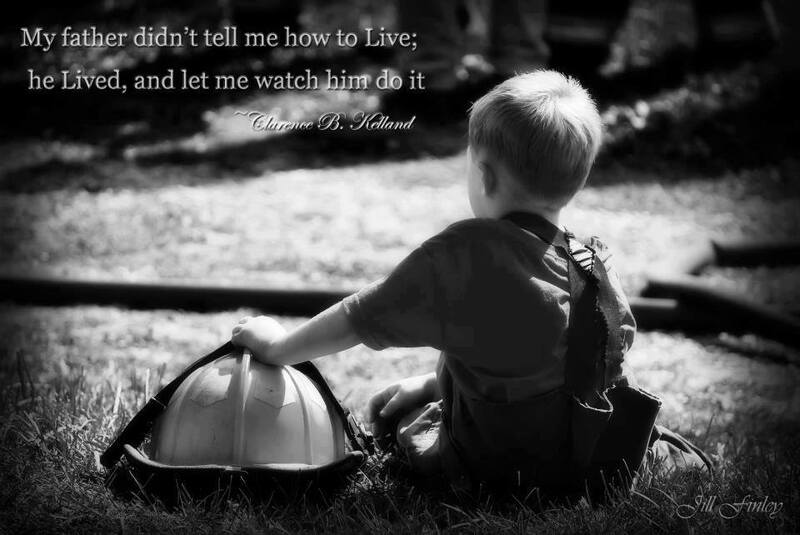 In my job in the fire service we practice like we intend to work, or in other words, we play like we work. The theory is that if you practice how you intend to perform in the heat of the moment, it becomes habit so much so that you don’t have to think about it when you’re in the moment…instinct. When we’re obedient in small things, it becomes instinct to be obedient in bigger things…not because we have to be, but because we want to be…instinct. God gives us free will, so it’s up to us…because it’s His desire that we’re obedient because we want to be. Mind you, it’s not that I particularly enjoy going out and being obedient to the work it takes to stay ahead of the weeds in the yard. I am obedient to the work, though, because I want to be. If I don’t want to go out and do the work, I don’t have to…no one is going to make me do it. I want to though…because I know the reward will be worth it in the end. And once I’ve turned the tide in my favor in the yard, I know that if I spend a little time each day and week to stay ahead and deal with each weed that sprouts up immediately, the work is easier than it is when I’m starting off with a yard full of weeds. It’s not much different spiritually really. In Matthew 13, Jesus tells the Parable of the Sower. There are similarities to what He is saying there and what I’m trying to say here. Rather than try to bring the two together, I encourage you to do as I pointed out above. Do your own research. Gather your own intel. Go read it for yourself and allow God to talk to you through it. Gather from it what He would have you to know. And so, it is my prayer that as you grow, your relationship with Christ is solid and set deep in the soil of your heart and soul. Because the weeds will come for you. We each have our own weeds to face…and yours will come. It might be a day…a week…a year after you’ve left my care, but they will come, and you will be faced with your own war. It’s my intent and goal in the coming years to help you foster a lush, green yard of faith and to equip you with the tools to battle the weeds in your spiritual life. Because, just like the homeowner before me cared for our yard, it was up to me to continue to care for it…or to neglect it. The same is true for you. Your walk is not mine to make. It is for you to decide who you will become. I’ll struggle with that when the time comes to let you go, and I’ll continue to pray that when that day comes God will strengthen me to face it. But for now, you’re mine to groom. I’ll start by waging an all out war with the weeds in my own spiritual life so that they are not an obstacle for you in yours.